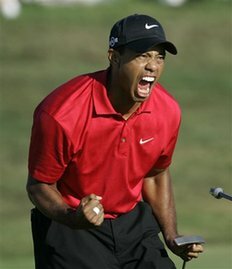 Tiger Woods announced Tuesday that he plans to return to the sport at the Masters Tournament in April. Four months after an auto accident and reports of extramarital affairs put his golf career on hold, Tiger Woods announced Tuesday that he plans to return to the sport at the Masters Tournament in April. Woods dropped out of professional competition in December after a Thanksgiving weekend wreck outside his Florida home turned a harsh spotlight on the golfer& #39;s personal life. In March, the 34-year-old golfer issued a public apology for cheating on his wife and said he was undergoing treatment for unspecified "issues." But on Tuesday, he said he was coming back to play in the Masters, which he has won four times since 1997. "After a long and necessary time away from the game, I feel like I& #39;m ready to start my season at Augusta," Woods said in a statement released by his agent. "The major championships have always been a special focus in my career and, as a professional, I think Augusta is where I need to be, even though it& #39;s been a while since I last played." The tournament is scheduled for April 5-11 at Georgia& #39;s Augusta National Golf Club. Billy Payne, the club& #39;s chairman, welcomed the return of the sport& #39;s top draw. "We support Tiger& #39;s decision to return to competitive golf beginning at this year& #39;s Masters Tournament," Payne said in a statement shortly after the announcement. "Additionally, we support and encourage his stated commitment to continue the significant work required to rebuild his personal and professional life." And PGA Tour Commissioner Tim Finchem added, "We were pleased to learn that Tiger Woods will be playing the Masters in a few weeks. He has invested a lot of time taking steps, both in his personal and professional life, in order to prepare for his return. We all wish him and his family the best as he rejoins the tour." Woods has won four PGA championships and six of the association& #39;s Grand Slam title.